Lou Dobbs Used Illegal Workers On His Properties: Report : It's All Politics The former CNN anchor crusaded against illegal workers while using them on his estate and more, according to an investigative report in The Nation. 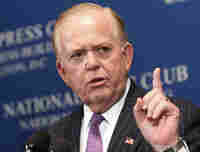 Lou Dobbs, the former CNN anchor who tapped into the wave of popular anger against undocumented workers, is being accused of benefiting directly from the labor of some of those workers on his own properties. As the story points out Dobbs, who has a radio show, has left open the possibility of a run for Senate or even the White House. It's safe to say the Nation's report won't be helpful to those ambitions.